Mechanistic and kinetic investigations in the laboratory are carried out in the field of atmospherically relevant gas-phase reactions of OH radicals as well as for ozonolysis reactions. The studies are focused on a detailed understanding of the degradation mechanisms. Special attention is drawn to unimolecular and bimolecular reactions of RO2 radicals, which represent the reactive intermediates in the course of the oxidation process. Findings of recent investigations describe the formation of highly oxidized RO2 radicals HO-C10H16(O2)2O2 from the reaction of OH radicals with ∝-pinene (Berndt et al. 2016), the formation of accretion products via RO2 + R´O2 → ROOR´ + O2 (Berndt et al. 2018) and the formation of the early products from the reaction of OH radicals with isoprene (Berndt et al. 2019). Selected product traces from the OH + isoprene reaction. Signals attributed to C5H8O3, C5H8O4, C4H8O5 and HO-C5H8(O2)alphaO2, alpha = 0, 1, 2, are shown depending on the reaction conditions. “O3 + C5H8” stands for conditions with OH radicals generation with isoprene ozonolysis and “OH/O3 + C5H8” with additional OH formation via tetramethylethylene (TME) ozonolysis. Product ionization was carried out by means of hydrazinium, H2NNH3+. The background measurement has been done in presence of isoprene. Ozone was switched on at measurement cycle 13 and TME at measurement cycle 46 starting the main OH generation. Reactant concentrations are [O3] = 9.4 x 10E11, [TME] = 2.0 x 10E11 and [isoprene] = 2.5 x 1012 molecules cm-3 and the reaction time 7.9 s. Stated concentrations represent lower limits, a measurement cycle comprises 60 s data accumulation. Berndt T., Richters S., Jokinen T., Hyttinen N., Kurtén T., Otkjær R. V., Kjaergaard H. G., Stratmann F., Herrmann H., Sipilä M., Kulmala M., Ehn M. (2016) Hydroxyl radical-induced formation of highly oxidized organic compounds. Nature Communications 7:13677, 8 pp., doi: 10.1038/ncomms13677. Berndt T., Scholz W., Mentler B., Fischer L., Herrmann H., Kulmala M., Hansel A. (2018) Accretion Product Formation from Self- and Cross-Reactions of RO2 Radicals in the Atmosphere. Angewandte Chemie International Edition 57 (14), 3820-3824, doi: doi:10.1002/anie.201710989. Berndt T., Hyttinen N., Herrmann H., Hansel A. 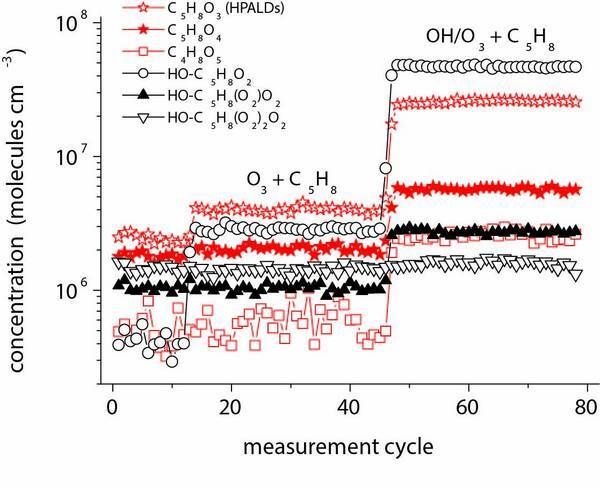 (2019) First oxidation products from the reaction of hydroxyl radicals with isoprene for pristine environmental conditions. Communications Chemistry 2 (1), 21, doi: 10.1038/s42004-019-0120-9.